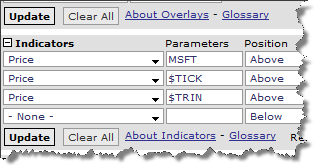 You can create a single chart that has multiple ticker symbols. You can then set it up to compare a stock that you are watching to other stocks, market indices, or to look at market internals. This can help you to better time your entries without having to constantly switch between different screens. Obviously this is a small version. My real intraday chart fills my entire screen. Here is an explanation of the 4 panels. The first panel is the stock that I am watching. In this example, it is a 5 minute chart of Microsoft. The Tick indicator is used to determine market strength. Readings above zero means that more stocks are trading on upticks - which is bullish. Below zero is bearish. 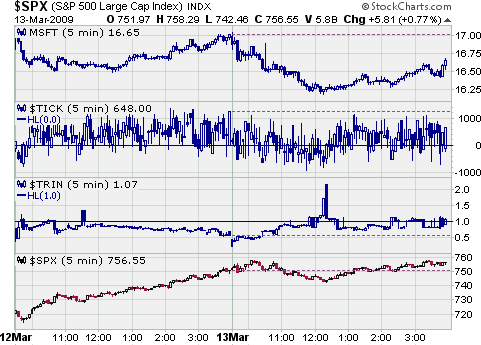 The Trin Indicator tells you the amount of volume going into declining or advancing stocks. A reading above 1.0 tells you that more volume is going into declining stocks, which is bearish. If the reading is below 1.0 then more volume is going into advancing stocks - bullish. In this panel, I have the S&P 500. Here you can compare the stock that you are watching to the market. This is useful for determining the relative strength of your stock. This is probably overkill for most swing traders but it is useful if you want to get the best possible entry. Plus, you won't have to constantly be switching to different screens to look at multiple charts. Nice.